The Aylesford Farmers Market is where you can get your hands on the freshest of food items at unbelievable rates. The market remains open on the third Sunday of every month and you can get everything from seasonal fruits, hand reared meat, fresh vegetables, artisan cake and breads, fresh fish to much more. Also, ciders, local wines, and delectable cheese can be found here. The market isn’t very large, but you sure can get your hands on a lot of interesting items. The food and drink options are rather extensive and you sure would enjoy your time at the Aylesford Farmers Market. How popular is Aylesford Farmers Market? Love it, go every month, just wish there was more stalls. Good home grown product's, great variety, enticing aromas. Supporting the local community. Brilliant!!! Lots of scrummy stuff to eat and goodies to take home. Gorgeous grounds with plenty of history to soak up! There are plenty of beautiful spots to sit down, read, contemplate, meditate and even perhaps have a picnic! There are also a few unexpected businesses in operation such as a pottery studio offering classes and an upholstery workshop although, the latter was not operational when I saw it so it would need to be looked into on a weekday. The venue also hosts business conferences and events such as farmer's markets. Unfortunately the on site tea room left much to be desired... There were no menus available so it wasn't easy figuring out what was on offer, the cakes tasted as though sugar had been left out when the sponge mix was made and the food that was on offer was limited in variety and lacking in quality. Aside from that definitely a venue that's worth a look in. 3rd Sunday of every month at Aylesford Priory. 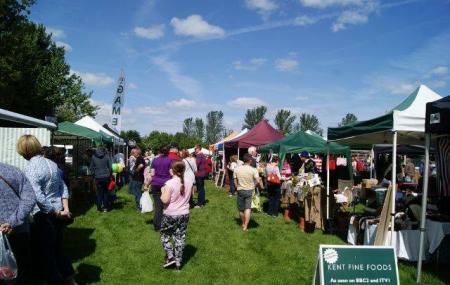 One of Kent's newest farmers markets, this market is organised by the same team that run the Award Winning Elm Court Farmers Market and Tonbridge, which is the largest Farmers Market in Kent. There is a stage with a demonstration kitchen for cooking demonstrations. These showcase our producers and local restaurants. There is a covered eating area which is a great place to have Sunday Brunch. The market is made up of mainly food stalls with a few craft stalls.